We’d love your help. 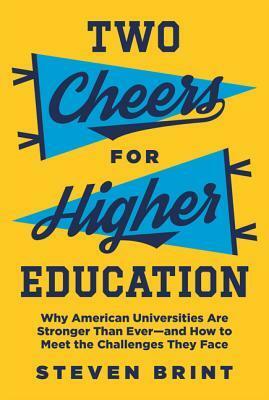 Let us know what’s wrong with this preview of Two Cheers for Higher Education by Steven Brint. Crushing student debt, rapidly eroding state funding, faculty embroiled in speech controversies, a higher-education market disrupted by online competition--today's headlines suggest that universities' power to advance knowledge and shape American society is rapidly declining. But Steven Brint, a renowned analyst of academic institutions, has tracked numerous trends demonstrating their vitality. After a recent period that witnessed soaring student enrollment and ample research funding, universities, he argues, are in a better position than ever before. Focusing on the years 1980-2015, Brint details the trajectory of American universities, which was influenced by evolving standards of disciplinary professionalism, market-driven partnerships (especially with scientific and technological innovators outside the academy), and the goal of social inclusion. Conflicts arose: academic entrepreneurs, for example, flouted their campus responsibilities, and departments faced backlash over the hiring of scholars with nontraditional research agendas. Nevertheless, educators' commitments to technological innovation and social diversity prevailed and created a new dynamism. Brint documents these successes along with the challenges that result from rapid change. Today, knowledge-driven industries generate almost half of U.S. GDP, but divisions by educational level split the American political order. Students flock increasingly to fields connected to the power centers of American life and steer away from the liberal arts. And opportunities for economic mobility are expanding even as academic expectations decline. To ask other readers questions about Two Cheers for Higher Education, please sign up.